Each fall, monarch butterflies from the U.S. and Canada begin a 2,000 mile migration to Mexico. The following spring, their great grandchildren return. 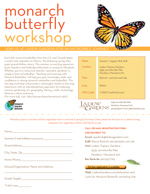 This summer, an exciting opportunity for teachers and butterfly enthusiasts is coming to Maryland. Whether you’re a classroom teacher, naturalist, gardener or simply a lover of butterflies, “Teaching and Learning with Monarch Butterflies” will help you gain knowledge, skills, and confidence in raising monarch caterpillars and butterflies. 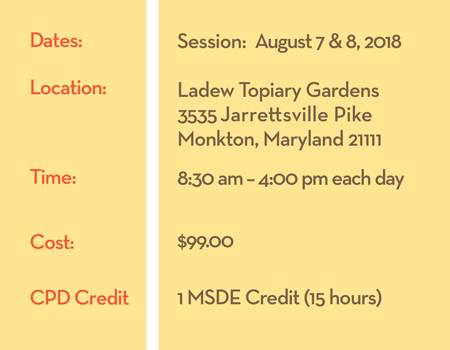 This two-day workshop will provide a meaningful, hands-on learning experience with an interdisciplinary approach of combining science, gardening, art, geography, literacy, math, technology, Mexican culture and more. To mail in your registration and payment download the form by selecting the image below.